This guide will take you each step of the way through setting up your Gmail email address in the Windows 10 Mail app. 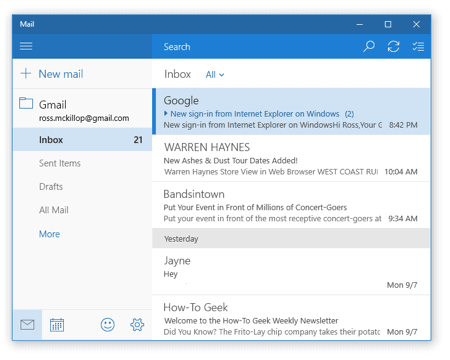 Unlike some other versions of Microsoft’s various email programs, Mail in Windows 10 does not require you to enable IMAP or POP within Gmail itself. You don’t even need to know what that means : ) Let’s get started! Welcome to the Welcome screen. Click Get started to, you guessed it, get started. Back at the initial Mail window, there will be a new button labelled Ready to go – click it. Ta-da! Your Gmail is now is all set up in Window 10. You can access Mail the same way as you did in steps #1 and #2, or you can click the mail “Tile” and it will open your Gmail. Another option is to click-and-drag either the Mail ‘Tile” or the Mail entry in the All apps list, to your Desktop. That will create a shortcut on your Desktop that you can use to launch Mail, if that’s your preference. If you have any questions, by all means leave a comment. Heya Mike – do you mean all accounts under one umbrella in “Mail” or in Outlook 2013? Since those are different Apps, it’s kind of a case of “pick one App or another, and put all your email in *that* place…” – make sense? i have my e-mail accounts linked but they wont sync? How do I get it to regularly sync? Alas, the “”allow”” button is grayed ( well blued actually;) out. So it stops there. Windows 10 mobile RS builds. I’m trying to connect my gmail account but every time I try to connect I get to the part where I accept the mail app to access the account then the page goes blank and it just reads connecting to service at the top. I’ve tried three different times and its still happening. The procedure for making g mail in window 10 is seen. This make possible for all those to do so. The specified performance make possible in style for best possible action. The procedure is mention for better performance. When I sent the email from my gmail (after setting it up on MAIL app), the receiver sees my email id (xyz@gmail.com rather Name in the FROM column). How do I make my name displayed in receiver’s inbox please..? Is there a way I can get INBOX by google to open up as my mail client using the Windows 10 pins ? Instead of having it use my account and using their app? PLEASE like it us on my phone and tablet? I want to add several gmail accounts to my windows mail? I have the gmail account loaded but the inbox is saying ‘nothing has arrived yet. How do I receive emails into it. Just trying to follow the instructions from your post back in 2015 to enable gmail from browsing links. Believe it or not, I can’t even locate the very first step, i.e. hit Win 10 start button, select ‘All Applications’. Where is this? I just can’t find ‘All Applications’ anywhere. Any help appreciated, thanks mate. Also, I note others have had problems in that their actual email addresses and not their plain language addresses appear in the receivers inbox.. do you actually still recommend the ‘Mail’ application in Win 10 for use with gmail? I have not been able to use ‘edge’ , and my PC has required more than one reinstall of windows. I have lost a lot of productivity by being ‘handbraked’ by these things. Your solution to enable gmail access from Windows ‘Mail’ looked so good.. yet once again, I try to give myself some help, and I just get handbraked and depressed. Hi, is there a way to get google as my main browser search engine in Windows 10? My browsers all use Bing, but I prefer google. My laptops are all HP. Thanks for any info.